So why is she posting a photo of a wasp's nest? I can just about hear people asking that and scratching their heads. Well, that's a good question. I would really love to have that wasp's nest sitting decoratively somewhere in my cabin, perhaps on the top shelf of a bookcase, displayed artfully with a bit of the branch it's on. 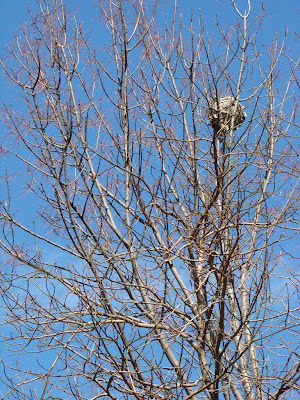 I pass this wasp nest every morning and evening, and every time I pass it I look at it longingly, willing it to fall down so I can retrieve it. It really doesn't look as though it's going to come down any time soon, but I can dream, can't I? As you can see from the photo, today is clear and calm ahead of more freezing rain predicted for tomrrow. Oh, joy! Just what I don't need. So far the feeder birds are unworried--no feeding frenzys yet--so I'll try and forget about that for now and just enjoy the pretty day. 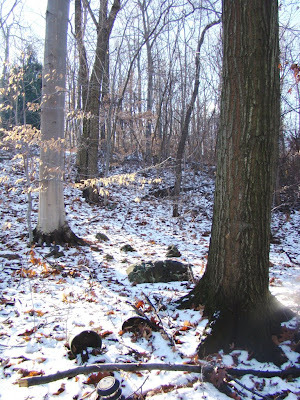 Even the little bit of snow that coverd the forest yesterday afternoon when I took this photo is gone this morning. A bit of rain, fog and warmer temperatures combined to make it disappear. All that is left this morning are a few fist-sized patches of it scattered here and there. Nature doesn't seem to like calm very much, though the saying says she abhors a vacuum. A day of calm weather is almost certainly to be followed by something more extreme or at least more active. Yesterday it was freezing rain. Today it is wind. Tomorrow? Well, the temperature will drop from the spring-like temperatures that greeted me this morning to a wintry 15 degrees by tonight. The rain had a bit of good effect at the cabin, at least from my point of view. 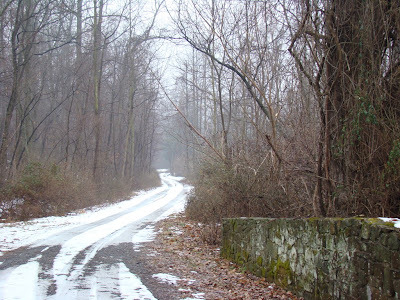 The driveway is largely clear of ice this morning and for the first time in weeks, navigating along it wasn't slippery. Although, in some ways, mud isn't much of an improvement, either. This morning, for the first time since the December ice storm, I saw a red-breasted nuthatch at the feeders. Is it the same one, I wonder? It is certainly a female. It was only there a moment and then flitted away. Has it finally gone through its stash of seeds? Quite literally, it came to the feeders about 50 times a day from the moment it arrived to when it disappeared. I soon realized it was storing its seed somewhere and couldn't possibly be eating that much. The one little bird was nearly single-handedly responsible for my high bird seed bill in November and early December. Then the ice storm hit, and until this morning I'd not seen one again and feared it was a victim of the storm. Perhaps it was just living off the stored seed that it must have kept in a hole the size of a small silo. In any event, I am glad to see its return, if only briefly. It's a good thing I took photos this weekend when the weather was nice. This morning's freezing rain didn't offer much opportunity for a new photo. Gray and gloomy doesn't begin to cover it. Dismal is the word that comes to my mind. The freezing rain is light, though it doesn't take much to make walking and driving treacherous. But perhaps because it is light, the birds that frequent my feeders aren't acting desperate, which is how I describe how their feeding frenzy before a big storm. So this morning I am posting a photo that's three days old, back when the day was a sunny one. 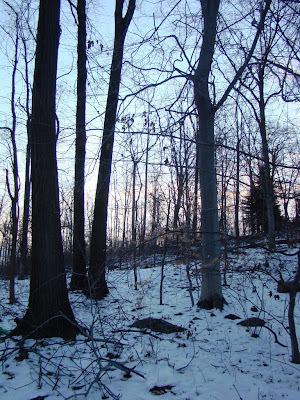 I took a walk in the forest behind the cabin (just visible in the background). It's a rocky section of forest, though it's not still too bad in this photo. Once past this easier section, the going is slower, which suited my mood that day. I can walk for an hour and not get too far, as I pick my way over or around the rocks and boulders. Because it is rocky, I usually try not to go too far uphill or dow nhill, as that only adds to the difficulty, especially when even this little bit of snow hides the smaller rocks enough to make balancing precarious. The boulders are easily visible, but it's still slow going as I pick my way around and between them. Deeper into the woods I found the downed tree that you see in my second photo. It's covered with shelf fungus to an unusual degree. 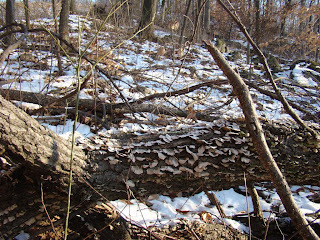 It's not uncommon to find fungus on a downed tree. It is uncommon to find as much fungus on the tree as you see here--and even that is just a part of it. In spring and summer, it's easy for me not to notice things like fungus. Leaves and color both combine to obscure the view of smaller things, sometimes. The bareness of winter helps me notice things obscured in the lusher seasons. That's part of the reason I like winter walks. It's a little bit like traveling in different territory, even when I am not far from home. It was a quiet weekend on the mountain for me--no flash of redpolls to get the adrenaline rushing, no extremes of temperature or precipitation to deal with. In fact, I think it was the quietest weekend of the winter so far, and that suited me well enough. 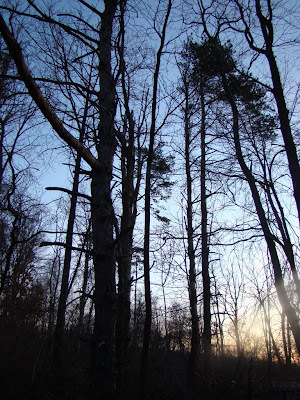 On Saturday, Dog and I took a short walk through the woods to reach an open area behind the cabin a ways. This used to be, or was planned to be, a ski run, but as it faces the west, it got a lot of sun and the snow never lasted. 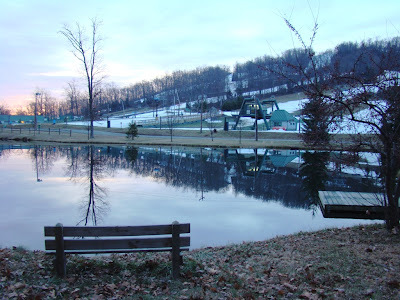 Today, Roundtop mows it once a year and uses it as a quick way to get down to the bottom of the mountain where they have one of their snow-making ponds. 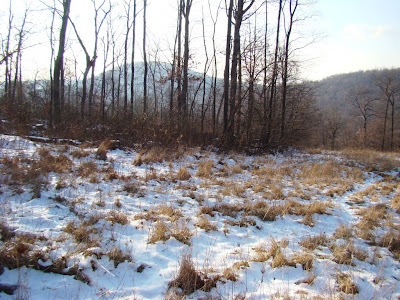 Dog and I explored around the edges, and I soon found a spot where the deer have been "yarding up" for the winter. 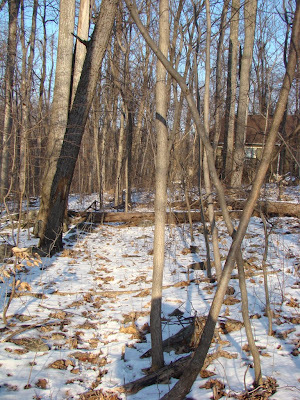 It was a small rounded area, perhaps 15 feet across, devoid of snow and filled with deer poop. So this is where the deer have been hiding! Dog had to smell everything, of course. 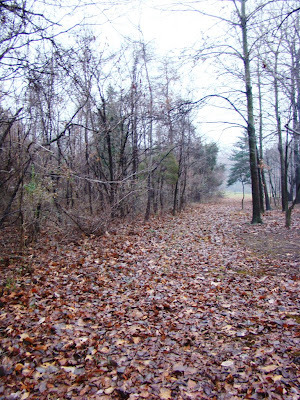 We walk back to the cabin, through the woods and I now realize that our frequent jaunts out here have created a trail. It's barely visible, and perhaps no one else would call it a trail or even notice it, but we know. We skirt the worst of the rocks, jump over a fallen tree and follow the flatest area back up to the cabin. Dog knows the way and is eager to prove it to me. Back in the cabin I can see our tracks heading into the woods. Even without intending it, I have left footprints on this earth, though I expect spring growth will soon hide what winter cannot. This morning the day has dawned clear and cold, though the bitter wind of last night is fading (for which I am grateful). As the sun is rising, the snow looks bluish and is about the same color as the eastern sky above it. The low-angled sun of winter creates a light that is much different than the harsher glare of warmer days. I find this especially noticeable during dawn and twilight, when the bluish light seems most mysterious and a bit off-kilter, somehow. I tend to be drawn toward extremes of things, so the light at the far edges of the sun's yearly route is the light I find the most intresting of the year. Daylight takes a long time to arrive during these winter days, moving through the colors that take night into day much more slowly than in summer. In winter, the night cedes way to day less willingly, or perhaps the day is simply more patient now. I have to be patient too, and wait for the right moment to try and capture the encroaching dawn. I stamp my feet on this cold morning and wait. In summer, the morning's sky colors arrive and change quickly, and then I must hurry. Grandmother Nature always has a lesson. Sometimes the lesson is patience. Sometimes the lesson is "move quickly!" Today the lesson is patience, and I try to be. And then, I think, the moment is finally here. Or at least the moment I choose is here, and I take the morning photograph. Snow still covers the mountain this morning, but it's not longer quite as pretty as it was on the day when it fell, which is when I took today's photo. 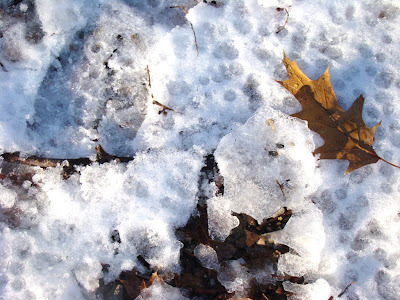 The little storm brought about 3 inches of snow, and this morning I have 1-2 inches of it left, along with long patches of ice where the snow was compacted by the car or my footprints. The temperature has flirted with 32 degrees for the past two days but hasn't quite gotten there. Still, bright sunshine on both days has added to the temperature, at least enough to briefly melt the top layer of snowflakes. Then, as soon as the sun sets, that layer refreezes and the result is that it's slipperier now around the cabin than it was during the little storm itself. I wear yak-trax on my boots--sort of like tire chains for people--and they work pretty well. The dogs are a different story. Even with their longer toenails, they slip and slide all over the place. Baby Dog enjoys this enormously and even seems to deliberately find ways and places to slip in ever more amusing style. Dog seems to be surprised that he slips, as though he doesn't understand how such a thing could be happening. The slippery conditions limit our morning walks. We no longer walk for a mile or two, as we do when the footing is good. Now, we inch our way down the lane at a speed that's too slow for the dogs and too fast for me. They pull at the leash, anxious to go faster. I hold on. In non-icy weather, both dogs walk well, at least most of the time, on a loose leash, but when we are moving this slowly, their eagerness to go faster overcomes their training. We must look ridiculous, though at the hour of our walks there is no one to see us, for which I am grateful. When it is time to head back to the cabin, they look ahead, along the trail we usually take, wondering why we are turning back so soon. We spend the same amount of time outside that we always do. We just don't travel as far as usual. They don't like that. To them, the distance is the thing, and apparently feel our walks should be the same, even if we would spend hours traveling the same distance. The concept of time isn't something I can teach the dogs. 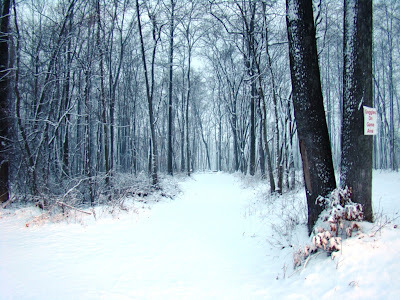 I ignore their disappointed looks and we inch our way back up to the cabin, slipping and sliding on the ice. The wind that roared through here the past few days has shivered my bones and rattled the still-clinging birch leaves against the branches. The sound of dried leaves against branches sounds like scratching, a sound I expect to hear in November, not January. But this year the birch leaves have refused to drop, and in a snowy, winter forest the sound seems especially eerie. The wind has finally calmed now, and though the weather it still cool, it now feels balmy in comparison. Last evening, it was overcast and I stepped outside without a jacket, though protected by hat, gloves and a warm sweater. For a few minutes that was even comfortable. I searched the sky for the full moon, but all I found was a large, slightly glowing area iverhead that was about the width of 10 full moons. 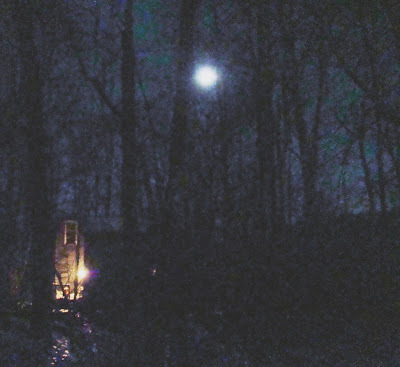 Try as I might, I couldn't locate the spot where the glow was brightest, though I knew the moon was in there someplace. By this morning, the clouds have disappeared, leaving clear skies and dropping temperatures. The moon was perfectly visible as it slid towards moonset in the west. I was struck by the cold blueness of the moon and the warm yellow of the porch light. And yet both looked inviting to me, though I can only reach the one. After the excitement of having redpolls at my feeders on Saturday, it's a safe bet that nothing is going to top that one for a while. The redpolls came the day before the temperature dropped into a very wintry range. I had 4 degrees at the cabin on Sunday morning, and with an 18 mph wind chill, it felt very cold. The wind has since calmed, and my feeders are probably now reaching their peak of activity. So many birds are in the feeder at once, it's difficult to count them all. This is especially true with the juncos. I try to count the most I can see at any one time, but they flit in and out so quickly that I never feel confident I've come up with an accurate one-time number. In this colder weather, the feeders are soon empty. When I'm home, I simply refill them as soon as I notice. During the work week, I fill them up as full as I can make them before I leave for work, but they are always empty by the time I get home. Based on how much the birds ate this weekend, I suspect the feeders are largely empty by noontime. This is the time of year when I sometimes feel as though I should be hibernating, too. On the sunny days, I am happy to be outside whatever the temperature, but when that wind blows, I will retreat to the warmest room in the cabin, where I want to do little but drink tea or read. Usually, the dogs and cats soon will join me and before you know it, we are all napping, huddled together as though we must to keep warm. 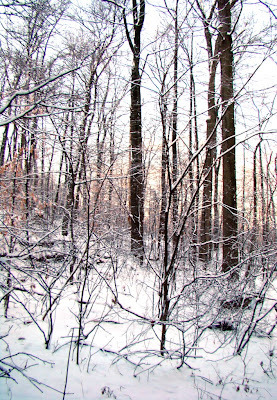 Naturally, I prefer the sunny, calm days when I can explore the quiet of a wintry forest. But even my temporary hibernation has its pleasures, in its quiet and slow pace. It's only then that I can reflect a bit and think, a rare pleasure in any season. O, Happy Day! 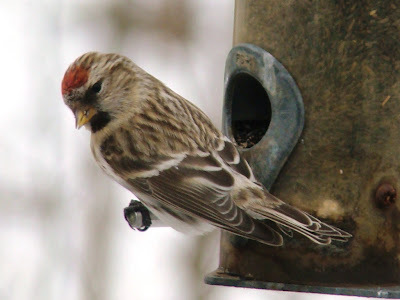 Redpolls in Southern PA! O, happy happy, happy day! 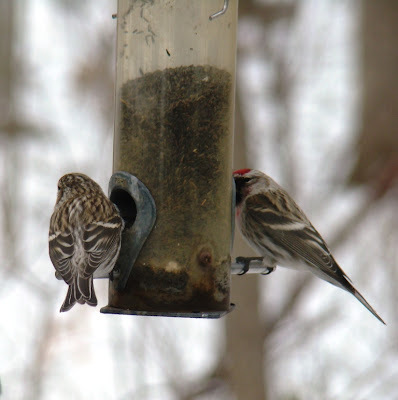 I have redpolls at my feeders! I have suspected (hoped) for a week or so that redpolls have been visiting my feeders. About 10 days or so ago the niger seed in the tube feeder began to be eaten at a much faster rate than has been typical. I knew something was eating it, and the two siskins and two goldfinch that are occasional visitors didn't seem capable of working on it that much alone. But with working during the day, and darkness already settled in by the time I get home in the evenings, I haven't been able to see what was making the seed in that tube feeder go down so fast. Naturally, I have been hoping for redpolls. I've seen redpolls at my cabin feeders exactly once before today, and I didn't have a camera in my hand for those few, brief moments. So this morning I'm sitting in the cabin with one eye on my book and one eye on the feeders, just sitting there reading, and you know, hoping. And then a sudden flurry of several species of birds bounces into the feeders and there they were. Three redpolls! So I look at them happily for a few seconds, and then I wonder, do I dare get up off the sofa, walk over to the kitchen table where the camera is and try to get a few photos? Yes, I think, I've seen them now, I know they were here. It's time to try for a photo. So I roll off the sofa to the floor and crawl over to the kitchen, where I retrieve the camera. Then I turn the camera on and get it ready, figuring that when I appear up at the window the birds will likely fly away. I move slowly, rise up in front of the window, and the birds are still there. I take one shot right away, hoping to get something if the birds scatter. But they don't. I manage to get several shots of them at the feeders before they wander off into the woods. The one in the second photo looks a bit suspicious, doesn't he? But he's actually looking at something down on the ground. Hooray! I've seen redpolls at the cabin! And gotten photos! I had a little bit of snow last night, about three inches. That's enough to be pretty and bring the birds to my feeders, but not enough to shovel. This morning the weather is clearing, and my feeders are filled with birds. Juncos sit all around the feeders, looking like plump little snowballs on the snow-covered branches. 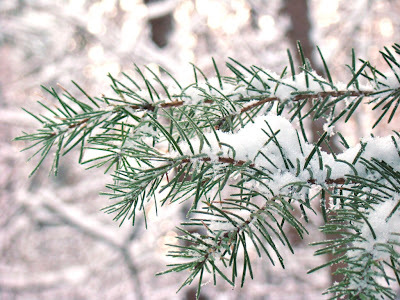 At a distance, they blend in so well that they are difficult to see on a snowy branch. The cats are ecstatic, and now that the birds have eaten, they are teasing the cats even more. One of the blue jays lands on the sill of the large window in the living area and peers inside at a cat. Another scolds the cat in the upstairs window and watches while the cat runs its feet over the glass in frustration. Dog and Baby Dog greeted the snow with even more enthusiasm than usual. Dog came inside looking like a glazed doughnut, frosted all over with snow. Baby Dog just runs. She runs back and forth and seems to enjoy herself all the more when she slips and falls headfirst. So it's been that kind of morning. Now the sun is getting higher and the clouds are clearing. It should be a pretty day, our little gift from Grandmother Nature before the weather turns very cold and windy later tonight. I'm going to go outside and enjoy it! This morning is again dark and gloomy, though it's a more interesting kind of gloom. A bit of snow is forecast for later today, and its likelihood seems to be confirmed by the numbers and amount of bird activity at my feeders this morning. The squirrels were also out in force, and Dog startled up a deer, though neither of us saw it. We only heard it rustling away through a dense area of thicket. The possibility of snow that will bring an end to this run of gloomy days is enough to raise my spirits on a morning that still looks gloomy. 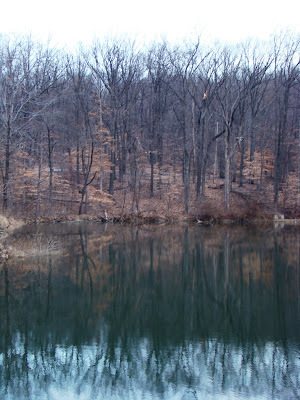 The only bit of color I could find came from the reflection of the sky in one of Roundtop's snow-making ponds. And I'm sure you'll agree that as far as color goes, it's not much. After the snow, the weather will turn colder than normal for at least several days, so it will really feel like winter again. It's not much, but I'm still looking forward to it. I'm starting to panic a bit. The mornings are so dark and gloomy that I haven't been able to take any photos before I leave for work for several days now. I took this photo earlier in the week when the morning was slightly less gloomy than today. If the lighting doesn't improve for tomorrow, I'll don't know what I'll post. Perhaps I'll have to resort to a photo of Dog or Baby Dog. In any event the temperature is at least fairly winter-like and the wind makes it feel very cold. Since I don't have any snow cover, the local feeder birds are able to find some food on their own, so activity at my feeders is somewhat diminished over other, snowier winters. The quiet around the cabin continues. Even the squirrels have been absent, though I can't say I mind that. I'm okay with squirrels using my feeders, despite how quickly they go through bird seed and corn, but I must say I prefer it when they aren't around. They eat so much that sometimes I think I spend more on food for critters than I do on food for me. The finch feeder seems to be quite popular this week, and I'm imagining that all sorts of wonderful winter finches that I never get to see are emptying it. I did see two pine siskins in it last weekend but redpolls have been reported in my area, and it's been years since I've seen any of those little darlin's in my feeders. I just hope whatever it is puts in an appearance sometime when I am home to see them. I can only hope. My grandparents were from upstate New York, and my mother lived there until she graduated from high school. I can remember her telling me that when the family moved down here to southern Pennsyvania how much they preferred the winters. It wasn't the cold of New York that they minded, but the seemingly never-ending gloomy winter days. She said they never had bright, sunny winter days where they lived, and that was what they really liked about Pennsylvania's winters. This winter hasn't yet been overly cold. Certainly, I haven't had long stretches of cold or normal winter weather. But I have had long stretches of overcast, gloomy days. This is only made worse by the shortened hours of daylight. My only chance to be outside during daylight is on Saturday, and when Saturday is gloomy, it's another full week before I have another chance to see the sun. Perhaps that's why I've been overly focused on looking at the sunrises lately. 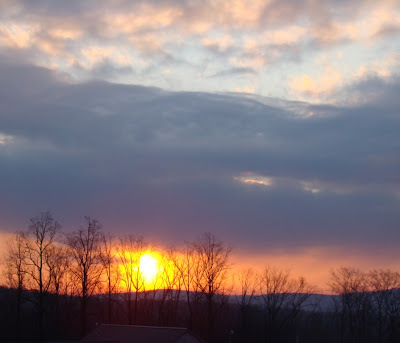 Even in this gloomy weather--and today shows every sign of being overcast again--the sunrises have been quite lovely for a minute or two before the sun slips behind the cloud cover yet again. The weekend around the cabin was a quiet one, both in terms of weather and in terms of the animals and birds I saw (or didn’t see). The promised snowstorm never materialized. Instead, I have fog. Animal sightings are especially low right now, and I don’t really know why. I haven’t seen a deer all week and only a single squirrel. Even bird numbers, especially for sparrows, are lackluster. Perhaps all this isn’t really as unusual as it feels to me right now. In a normal January, much of my focus and energy is spent dealing with snow or ice and deciding if I should attempt to drive up the mountain to the cabin or to just park the car and walk up. If I decide that walking is needed, then I might have multiple trips to lug groceries, dog food or bird seed up the hill. But this year, it’s been warm and quite lacking in snow, so my normal wintertime focus is altered. I don’t really think that’s the answer, but I’ve been wrong on at least a few occasions in the past, so I’m leaving open that option as a possibility. This morning the fog made the morning dark and only added to the quiet around the cabin. I'm starting to miss sunnier weather. Perhaps the animals do too. Thunderstorms in January are not the norm here. This morning around 4:30 a.m., a flash of lightning wok me up. It was a sufficiently strange experience that for a while I wondered if I’d dreamed it, as no rumble followed that first flash. Then, just as I was falling asleep again, I saw another flash. The storm rumbled around for a while, not particularly severe, and even disappeared for 45 minutes or so, but naturally it made a reappearance when I was about .25 mile from the cabin walking Dog. I’m pretty sure I’ve never had a thunderstorm before when in was 34 degrees outside. Now 34 degrees counts as a warm January morning, but it’s not so warm that I would expect a thunderstorm. The list of weather oddities these past few years just keeps getting longer and longer (and odder and odder). This morning was too gloomy and foggy to try for a photo as I was leaving the cabin. So I'll leave you for the weekend with a photo I took last weekend, also on a gloomy day, though not as gloomy as today. The record-breaking warm weather of the past few days has forced Ski Roundtop to close for today and tomorrow. With temperatures into the mid-60’s, the resort has lost a lot of snow this week. 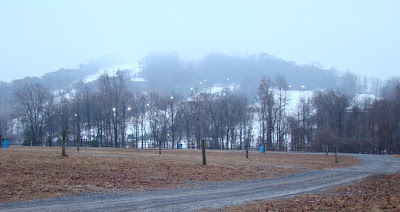 You can see in this photo, even one taken as early as I took this one, that not much snow covers the slopes. This is what global warming looks like at the local level. The rain that’s predicted for this evening is also likely a factor in closing the slopes now. So far this season, we’ve had about 7 days of actual winter temperatures—2 days here, followed by a week of warmth, another 3 days of normal temperatures, then more warmth. I might as well be living in, say, Virginia. Up at my cabin, this cloudy and damp morning brought me more birds than has been usual at this time of day—or perhaps it was simply today’s extra minute of daylight. I heard a great horned owl the moment I first stepped outside. It wasn’t very close, calling from somewhere down deep in the valley. Their call is one of those haunting sounds, like the call of a loon or the scream of a red-tailed hawk, that always draws me out of myself and makes me pay attention to the natural world around me. The Carolina wren trilled loudly just a moment later and was much closer. My feeders were soon full of the usual suspects. Other than the ubiquitous squirrels, I haven’t seen many animals around the cabin for a while. Perhaps they are still wary from the hunting seasons. Even so, it has been longer than usual since I’ve seen deer, raccoons, opossums, fox. The lack of raccoons isn’t a real surprise, perhaps not even the ‘possums, but the deer and fox have also been strangely absent. Of course, with the weather as it has been, what used to be normal isn’t normal anymore. Perhaps the animals are as confused as I am. The days are slowly lengthening here, just a minute a day right now. Even so it is now light enough when I leave for work in the mornings that it is no longer dead dark or even so dark that the landscape is entirely in chiaroscuro. On clear mornings, like this morning, I can see some colors, though they are still muted. And this morning I even saw some birds. A family of crows were up, haunting the upper parking lot at Roundtop. Seeing any bird again during the work week after what feels like months where it is too dark before and after work to see anything is cause enough for me to celebrate. This family of 7 were scavenging for bits of food dropped by skiers—the odd French fry, a piece of hot dog bun. They were also outraged by my presence, perhaps already used to having the parking lot to themselves in the mornings. I was almost mobbed by them when I got out of my car to snap today's photo. When I finally retreated, a few still followed the car, one or two on each side of me, as though they wanted to make certain that I was leaving them to their goodies without taking any for myself. Regular readers know that my aspiration (I hate to call it a resolution) for 2008 is to reduce my consumption and lighten my footprint on the earth. I expect 2008 will be a year of journey for me as I move in that direction and look for ways I can do that. So much of what I read about what people can do as individuals isn’t something we can pull off right away. Except for changing over to those new-fangled light bulbs, the suggestions are often about buying smaller cars, using public transportation and eating locally. Well, whatever kind of car you may or may not have, few people can afford to run out and switch to a different one right away. Public transportation isn’t available everywhere. Eating locally is something I try to do during the growing season, but that doesn’t work as well in winter. So what else can I do? At the moment, I’m focusing on water and reducing how much of it I use. I have a well, so my water usage isn’t monitored by anyone except me. My water use impacts the area’s water table, which in some years has fallen dangerously low. To reduce my own water consumption, I am currently rethinking the daily shower. No, I am not giving up keeping clean, so don’t let your minds wander there even for an instant. So who decreed that we have to run a shower in order to clean up and stay socially acceptable? Since when are gallons of water needed to wash one human body? What’s wrong with the old bowl bath or basin bath or the old basin and pitcher combination? That uses no more than a gallon or two of water. Fill with hot water, use soap and wash cloth. Rinse. It’s fast, it’s easy. Let’s do some math: The average bath uses 30-50 gallons of water, according to statistics I found. If your home was built before 1992, the water coming out of your spigot is likely to run at about 5 gallons a minute. If you take a 4-minute shower, you’ve just used 20 gallons of water. If your house was built after 1992, you might have a water-restricting showerhead, and your 4 minute daily shower just used 10 gallons of water. Even conscientious folks often take longer than 4 minutes in the shower. That’s still, in my opinion, an awfully lot of water, and over time it really adds up. You may not want to forgo showers forever, but what if you mixed the bowl bath with an every other day shower? By doing just that you will save a lot of water. Assuming you have a water-restricting shower head, by changing to 3 showers a week at 10 gallons each (assuming you are one of those 4-minute shower people) and 4 one-gallon bowl baths, you will use 34 gallons of water per week to keep clean versus 70 gallons, a savings of 36 gallons of water. Over a year, this amounts to 1,872 gallons of water saved. If you have the 5-gallon per minute shower head and use 20 gallons of water per 4-minute shower (or if you are an 8 minute shower person), your water use will drop from 140 gallons per week to 64 gallons, a savings of 66 gallons of water in just one week. For a year, this savings jumps to 3432 gallons. For a 50 gallon daily bath, you will use 350 gallons of water per week. Just by dropping to 3 baths per week and four bowl baths, your water usage will drop by nearly 200 gallons of water in just one week and will save 8008 gallons per year. And let’s say you suddenly decide you want to go from a 50 gallon daily bath to a 4 minute shower/bowl bath combination. Your water savings will be 16,432 gallons per year. Imagine if just 1000 people in the U.S. did that. The water savings from that would be the size of a small reservoir. If you don’t think any of this is a big savings in water use, try to imagine how you’d feel if you had to go down to the local pond, stream or well to haul water back to your house every day, as so many people still do. Suddenly, those 36 gallons or 66 gallons or the 100+ gallons of water for the bath people saved per week look huge. And though most of us don’t have to do that, over a year or over a lifetime, a little conservation that doesn’t substantially change how we live can have a huge impact. Have you noticed how frantically birds feed before a storm? I noticed that at my feeders on Saturday. The storm that eventually arrived wasn’t much, but the barometric pressure dropped quite a bit, and I think that’s what the birds respond to. At one point, I had so many chickadees and titmice flitting in and out of the feeders that I couldn’t count how many I really had. The bitter cold of earlier in the week has been replaced with an atypically (or can we even call it that in these days of global warming?) warm spell. All that’s left of the natural snow are a few patches here and there where the sun doesn’t reach. The storm that came through on Saturday was only a few rain showers, but the barometric pressure dropped quite a bit after the clear, windy high pressure system that covered the area just two days before. It has now gone from 10 degrees to 60 degrees, and I am scrounging in my closet trying to find my least warm winter clothing to wear so I don’t have to dig out my put-away warmer weather clothing. I think the birds felt that air pressure dropping, and instinct told them that meant a storm. In most winters, that kind of pressure drop would mean an imminent snowstorm, not a warm-up with rain. The birds fed as though they didn’t expect to get another meal too quickly, which would also be true in other years. Their feeding frenzy brought a new species to my feeder—pine siskin--and that was a nice bonus. This week may turn out to be a bit thin for photographs. The weekend was dark and gloomy. I kept waiting for the light to improve to take a few photos—and it never did. Today’s photo was taken earlier last week. 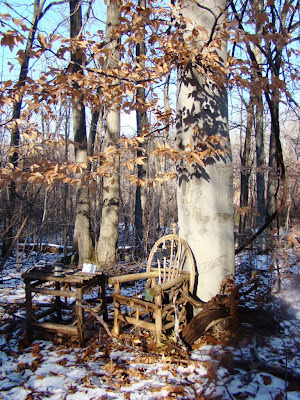 It shows one of the beech trees in front of the cabin and its neighbor, an oak tree—red oak, if I remember correctly. My winter morning dawned cold and bright today with 11 degrees. This morning actually feels warmer than yesterday when the temperature was a few degrees warmer but the wind was brutal. I’m much happier with a colder temperature and no wind, thanks very much. My bird feeders are emptying almost as fast I can fill them or at least that’s how it seems to me. 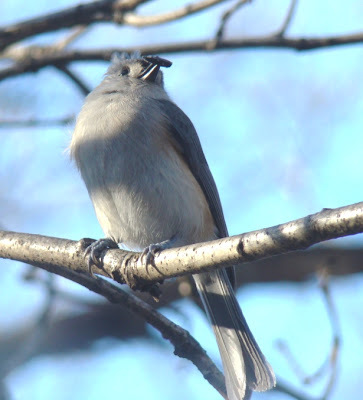 Today’s little titmouse had just visited my feeder and was pausing, with his sunflower seed prize still in beak, before heading back into the woods. I think he saw one of my cats at the window and figured it was best to sit still for a few moments. Soon enough, he realized that a cat on the other side of a window was no threat and flew off. 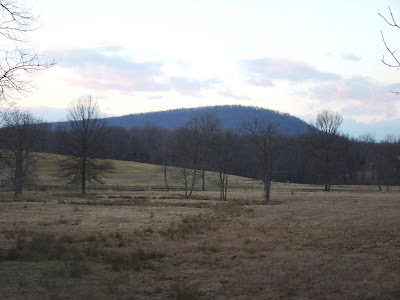 January is a month where the total number of bird species I see at Roundtop typically range between 25-26, so with the 18 I’ve already seen, I can only really expect to find 7-8 more species. Turkey Vulture is still "missing" from my list so far, but I expect to see that this weekend. I did see several last weekend but not "quite" within the confines of Roundtop and my cabin so I didn’t count them. Mourning Dove, Red-bellied Woodpecker and Carolina Wren should also be "gimmee" birds as soon as I’m home in daylight to see them. Red-tailed Hawk, Great-horned Owl, Northern Mockingbird, Hairy Woodpecker and Pileated Woodpecker are other January birds I normally have on my bird list. These can sometimes be slightly harder to find. Mockingbirds seem to head off the mountain and down to more protected areas in the coldest days, so I’ve occasionally gone throughout January without seeing one. Of the other four, the Pileated Woodpecker is the most likely to be the least likely sighting. They are always around but sometimes don’t make an appearance when I’m around. Black Vulture, Brown Creeper, and Song Sparrow are other possibilities. January’s few hours of daylight are my biggest barrier to nudging the list much higher. Bird viewing is limited to the weekend, mostly even to Saturdays as I work a full day on Roundtop on Sundays. Nature’s garden surrounds my little cabin. Tiny spring beauties, wild violets, dogtooth violets and wood sorrel line my driveway in spring. These little gems are really small, so even those with intense shades of color can be easily overlooked. And sometimes, I just want something large and splashy. Over the years I’ve found that large and splashy blooms combined with little sunlight isn’t an easy combination to come by. And, even if it was, I don’t want planted non-native flowers to overpower the little native jewels. So, I have designated an area near a beech tree that gets a decent amount sunlight in the front of my cabin as my garden. I like geraniums, usually the deepest reds, but I also always buy at least one native plant that I don't normally see in my forest and then plant it somewhere on the property. Sometimes they take hold, sometimes they don't. My "garden" is really just various natural-looking containers gathered in this one spot. When I drive in to the cabin from being away, the colors greet me as I enter my little domain, and satisfy my desire for big and splashy blooms. Now that winter is here (and with a vengeance this morning), the little garden area looks forlorn. But yesterday for a few moments, the sun hit the wooden chair that holds my spring plants, and it looked pretty again, albeit in a kind of anticipatory way. The beech leaves haven’t yet fallen; they are about the only leaves that haven’t yet. The leaves looked as though they were still sheltering my little garden even in winter. New Year's resolutions are not my thing. But this year I've thought of one I like and can aspire to: I will strive to make my imprint upon this earth as light and as fleeting as a footprint in the melting snow. I want to step on the earth with as little impact as a chickadee. I wish to be little more than the fog that twines between the trees of the forest. I want to be like a leaf that buds in spring, revels in the summer wind, explodes with color in autumn and then falls to the ground, only to be covered by winter's snow, dissolving gradually into the earth from which the next generation of trees will spring. Practically, this means I will be searching for ways to have less impact on the earth, though I am not planning to go completely feral and live under a stump. So there will be compromises. January 1 also marked the beginning of my new year's birding list, and that turned into a good day. I counted 18 species of birds, the total no doubt helped by a balmy morning. My most interesting sighting was not a bird but a bat that I found holed up in a corner of Roundtop's lodge. Good new year to all of you!